Summer is definitely here! Hot sun, cool drinks, great friends, fun get togethers all make for photo ops that you will want to cherish. 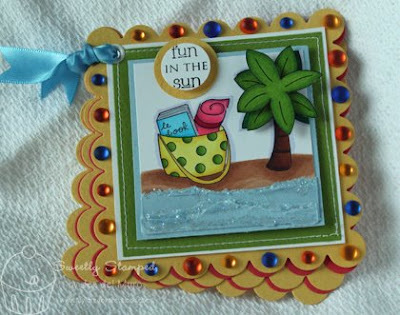 I myself am not a traditional scrapbooker, but love the little books that I see several people making. In fact, last weekend at the Great American Scrapbook Convention I saw many mini books that I could purchase. I got to thinking that I really could use my Nestabilities and make my own shaped book(s). So, that's just what I did! 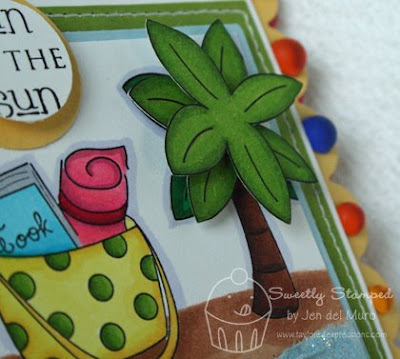 I used the Beach Bum set, along with the Beach Bum Key Ingredients Kit to create this mini book. I don't have any good summer pics yet, so the book is not full and complete. However, I really like the way that the cover came out and think this will be a great way to document summer fun. These waves (in the photo above) were created by ripping cardstock, tearing apart the cardstock layers and adding Diamond Stickles. Taylor had a great idea to layer the tree on one of her creations that she showed last week. I had to follow in her footsteps and try it for myself. I think this will be my standard for using this set now! Thanks for that idea, Taylor! Oh, how darling! Love all the bling and that sparkly water! Oh my WORD, Jen! 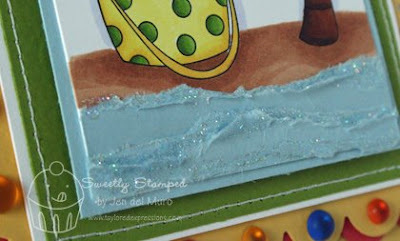 This is totally cool!....LOVE your coloring and I love the bling all the way around the edge. The sparkly waves are just SO FUN!! Love this! LOVE this Jen! I agree with Denise, this is SO totally cool! I am SO going to make myself one of these! AWESOME girl!!! THis is just adorable, Jen! LOVE it! What a fantastic mini book! Great images and colors! Love the blings. :o) TFS! This is a neat idea. You did a fantastic job on the book and your coloring is exceptional. I need that set!! Thanks!